Slip and trip injuries are extremely common and can result in anything from slightly dented pride to severe and permanent disability. All slip injuries are caused by the interface between your shoe and the surface being walked on being compromised by contaminants. This results in a reduced amount of friction between the two surfaces which in turn makes walking on them all but impossible and extremely hazardous. Common contaminants include ice, snow, water, sand, soap, grit, gravel, oil, diesel and food debris. Slipping may simply involve coming into contact with the floor surface itself or in some cases falling onto other hazards due to slipping, or even being burnt or injured by the contaminants responsible for your slip. 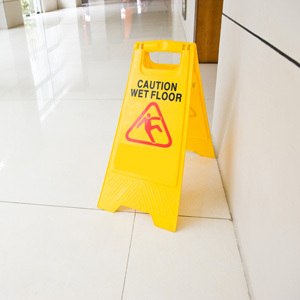 Accidents involving slips and subsequent falls are sometimes known as ‘slip fall accidents’ or ‘slip and fall accidents’. You may even be uninjured but suffer loss or damage to your possessions – for example you may slip on a patch of diesel in a petrol station and suffer damage to your clothing in the form of contaminants that cannot be removed. Contact someone nearby to obtain help. If you are, or believe that you are more seriously injured then ask that person to call for medical assistance – this could be anything from an on-site first aider (on a business premises) to an ambulance – depending on severity. You may simply have suffered minor bruising as you fell, but there is always a risk of limb, spinal or head injuries and so you should seek appropriate attention or seek out someone else to arrange this for you if you are unable to do so yourself. Record as much relevant information as you possibly can, including precisely where it took place and the circumstances leading up to the event itself. If your accident takes place in a business premises then ensure that the incident is recorded adequately in their Accident Book. It is a legal requirement that they possess one of these. Many business premises may also complete additional paperwork regarding the incident – ensure that you agree fully with anything being documented as anything recorded will likely be produced at a later date as they attempt to defend themselves against any potential claim for damages. Do not sign anything if asked unless you feel that it is an accurate representation of events. If in doubt, don’t sign anything that you feel may compromise your case for negligence. If your accident takes place in a public place such as a road or pavement then you should notify your local council. If your accident takes place at work then you should notify your employer and ensure that it is adequately recorded. Some accidents, depending on nature and/or severity must legally be reportable to the HSE or local authority under RIDDOR (Reporting of Injuries, Diseases and Dangerous Occurrences Regulations 1995) which assigns employers and premises operators a legal duty to do so. Witness statements and contact details. The account of independent witnesses can be of vital importance in slip, trip and fall compensation claims and this cannot be overstated to prospective claimants. Photograph the location and cause of your accident as soon as possible if possible, before it has been rectified and the evidence removed. Detail and account for any loss or damage to your clothing and personal possessions. Supermarkets – in an environment containing so many liquid items it is inevitable that spills and breakages will occur. It is the responsibility of the owner or operator of the premises to ensure the safety of their customers by ensuring that any such spills, breakages or hazards are dealt with straight away. The slippery surface should be isolated and cleaned or cordoned off to prevent the public from slipping on the spillage or debris. Public Highways – the council or local authority has a responsibility to ensure the safety and adequate maintenance of public highways and if you were to slip on a road as a result of poor maintenance, foreign matter or surface contaminants such as oil, diesel, snow or ice and the council is considered to have been negligent in remedying the issue in a timely manner then you may be able to make a personal injury compensation claim in this respect. Even if the council is not deemed negligent you may be able to pursue the person or persons responsible for the contamination that led to your accident – this may be a contractor or a utility company or suchlike. Pavements – councils have an obligation to ensure that pavements are safe and adequately maintained and that any potential safety or maintenance issues are resolved promptly. Slip injuries on pavements could occur for many reasons, such as ice and snow or other contaminants such as oil or diesel or loose matter such as gravel. As with public highways, if your you sustained injuries as a result of your slip it is possible that even if the council is not guilty of negligence, the actions of a third party may well have been, and if that is the case then you may be able to pursue them for compensation instead.